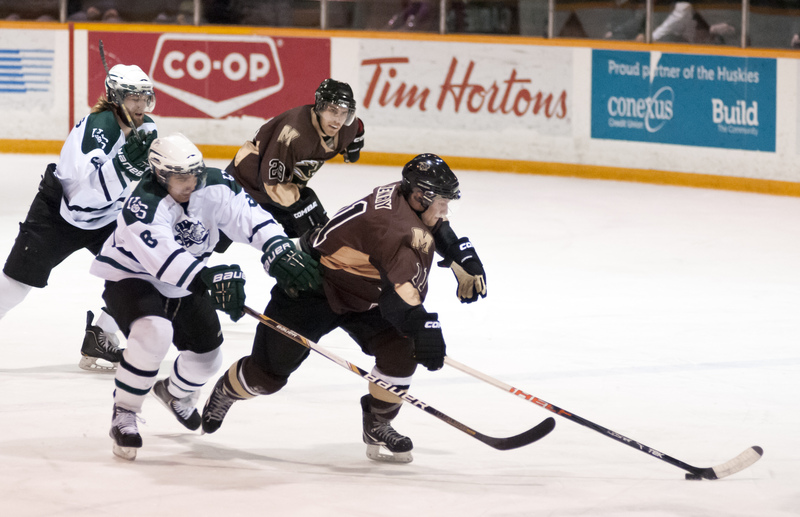 The Canada West Semifinal between the Manitoba Bisons and Saskatchewan Huskies was not at the venue the Bisons likely would have preferred after seeing their second place position evaporate in the last game of the season. Nonetheless, after sweeping Regina in the Canada West Quarter-final series, they went into Saskatoon raring to go, winning by scores of 6-2 and 5-0. Friday night’s game did not go how the Bisons would have liked, as the Huskies dominated the opening period. Sixteen shots were put on net, and by the time the period ended four shots had evaded Jesse Deckert and made their way into the Bison net. The second period saw the teams trade goals, with Ian Duval finding the net for Manitoba. Saskatchewan added two more in the third period to make the final score a resounding 7-1 victory for the Huskies. It looked as though Saskatchewan’s path to the Canada West Final would be an easy one. The Bisons had different plans, though, and played a much better game on Saturday night. Despite an undisciplined game that saw the Bisons face nine separate Saskatchewan power plays, the Bisons relied on the steady play of goalie Jesse Deckert to keep them in the game. The Bisons held a 1-0 lead going into the third period, and came up big while facing elimination. They would add three goals in the period as they won by a 4-1 margin, with Deckert turning aside 33 of 34 shots and the Bisons getting goals from Ian Duval, Dane Crowley, Matthew Lowry, and James Henry. The Bisons victory meant a rubber match would be needed on Sunday night to determine who would move on to play Alberta in the Canada West Final. Unfortunately for the Bisons, they got off to another slow start on Sunday night. Twelve shots against in the first period to just four from the Bisons saw U of M trailing by a score of 1-0. Despite a better period by the Bisons, it was once again Saskatchewan finding the scoresheet to make it 2-0 after two. The Huskies struck quickly in the third to make it 3-0 less than a minute in, and 4-0 just four minutes later; the Huskies were in the driver’s seat. The Bisons had a number of chances in the period, including a few on the power play, but a lone Ian Duval goal was not enough, as the Bisons lost 4-1, eliminating them from the Canada West playoff series 2-1. – Fifth-year Bisons netminder Jesse Deckert went 3-2-0 with one shutout and a 91.4 per cent save percentage. He was a big reason the Bisons made it as far as they did. – The top line of Ian Duval, Tyler Dittmer, and Blair Macaulay decimated the Regina Cougars, and the hope was for similar results in Saskatoon. However, Macaulay was injured after being boarded in the first period of Friday’s game and would miss the remainder of the series, a huge blow to the team as their leading point getter in the regular season was sorely missed. – Ian Duval managed to accumulate 11 points in five games, with three goals and eight assists leading all Canada West players in points after two rounds. In his second-last week as a Bison, fifth-year forward Tyler Dittmer put up nine points in five games, with a dominant four-goal night in the decisive game against Regina, earning him Canada West Male Athlete of the Week honours. Blair Macaulay was a force on offence against Regina, so it’s no wonder his absence was felt against Saskatchewan. The speedster notched six points in three games. – Fifth-year Tyler Feakes and graduating players Matthew Lowry and Del Cowan also concluded their Bisons careers in Saskatoon this past weekend.